Operas – Arcola Theatre and White Bear Theatre. 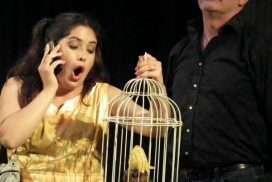 The Telephone, or L'Amour à trois is an English-language comic opera in one act by Gian Carlo Menotti . Ben bearing a gift, comes to visit Lucy at her apartment; he wants to propose to her before he leaves on a trip. Despite his attempts, Lucy is occupied with interminable conversations on the telephone. Cox and Box (The Long-Lost Brothers) is a one act comic opera with libretto by F. C Bernard and music by Arthur Sullivan. It was Sullivan’s first successful comic opera. The story concerns a landlord who lets a room to two lodgers, one who works at night and the other who works during the day. When one of them has a day off, they meet each other in the room. Tempers Flare. They discover they are both betrothed to the same women...will it end happily? This show has also been performed at The White Bear Theatre. London. The Maltings Theatre. Hertfordshire and Kings Langley.